Nancy married (1st) Samuel Malone on 27 December 1882 and together they had one child, Fannie. [Samuel Malone was born in August 1861.] She married (2nd) Charlie David Mantis Johnson on 17 July 1889. Together they had four children. Nancy died on 7 November 1944 in Liberty (DeKalb County), Tennessee. father died when he was an infant and he wound up dying in the poor house in 1916. Landa (or Landon) Malone was born on 18 November 1903 in Smithville, Tennessee, and married Ida Bell Crawford (1899-1983) in about 1922. Landa died on 18 June 1967 in Walker County, Georgia. J. M. Malone was born on 8 November 1925 in Bledsoe County, Tennessee. According to his headstone application, he served in the military. He died on 5 June 1950 in Nashville, Tennessee. Hollis Paul Malone was born on 26 August 1927 in Bledsoe County, Tennessee. He enlisted in the U.S. Army in February 1946 for duty in the Panama Canal. Hollis died on 23 September 1971 in Catoosa County, Georgia. Crawford L. Malone was born in 1930 in Bledsoe County, Tennessee, and served as hospital corpsman third class in the U.S. Navy in Korea. Crawford died in 1989. Beulah Ruth Malone was born on 14 October 1935 in Bledsoe County, Tennessee. Beulah died on 16 August 1995 in Rossville, Georgia. Harvey A. Malone was born on 19 March 1906 in Warren County, Tennessee. He married Vesta Lou McDowell (1910-1966) in about 1927. Harvey died on 25 September 1974 in Chattanooga, Tennessee. Etheline Malone was born on 28 June 1928 in Georgia. She married first to Mr. Harris and second to Robert Richmond. Etheline died on 28 February 2009 in Chattanooga, Tennessee. Hubert Loyd Malone was born on 8 January 1931 in Warren County, Tennessee. Hubert died on 18 June 1940 in Walker County, Georgia, in an accidental drowning. Pat Malone (a male) was born on 21 Marcg 1935 in Chattanooga, Tennessee, and died on 28 August 2012 in Chattanooga. Ocie Mae Malone was born on 22 June 1909 in Warren County, Tennessee. She married first to Reno L. Fields (born in about 1905) and together they had one child. She married second in 1933 to James Edwin Harden (born in about 1913). Ocie died in September 1980 in Chattanooga, Tennessee. Eugene Joseph Fields was born on 8 July 1929 in Warren County, Tennessee. He was raised by his mother’s mother, Fannie Malone. He served as a private first class in the U.S. Marine Corps during World War II. Eugene died on 18 June 2003 in Seminole County, Florida, and is buried in Chattanooga National Cemetery. Paul Malone was born in about 1912 in Warren County, Tennessee. He married Ella Mae Barnett (1909-1991) in 1929. Joyce R. Malone was born on 23 April 1930 in Rossville, Walker County, Georgia. She graduated from Rossville High School in 1947. In the 1960s she was involved with community theater in Greensboro, North Carolina, starring in the play “The Women.” She married Jack Murray Scoggins (1928-1996). Joyce was employed with RCA for twelve years. She was also a member of the Cumberland Town Board for four years, the Franklin Road Church of Christ, and the Greenfield Community Choir. While living in Richmond, Virginia, she worked for the Baptist Foreign Missions Board. She was an extensive traveler, and her husband, children, and grandchildren, were the joy of her life. Joyce died on 6 February 2010 in Indianapolis, Indiana. Garnett L. Malone was born on 17 February 1932 in Walker County, Georgia. Garnett died in August 1987 in Chattanooga, Tennessee. James Grady Malone was born on 29 November 1915 in Warren County, Tennessee. He enlisted in the U.S. Army during World War II in December 1942. James died on 27 August 1992 in Chattanooga, Tennessee. Virginia Malone was born on 1 March 1918 in Warren County, Tennessee. She married Willard T. Jones (1919-1985) in about 1940. Virginia died on 10 February 1998 in Chattanooga, Tennessee. They are buried together in Chattanooga National Cemetery. Roy David Malone was born on 2 May 1921 in Warren County, Tennessee. He served as a corporal in the U.S. Army in World War II. Roy died on 4 September 1989 in Chattanooga, Tennessee, and is buried in Chattanooga National Cemetery. Josephine Lorraine Malone was born on 9 April 1923 in Warren County, Tennessee. She married Richard Andrew Norburg (1918-2003) on 4 August 1943. Josephine died on 6 January 1999 in Tift County, Georgia. Linzy Thompson Johnson was born on 16 April 1890 to Nancy and Charlie Johnson. He married on 7 September 1911 to Adeline Williams. [Adeline Williams was born on 25 October 1887 and died in 1975.] Linzy died on 14 October 1957. He lived his entire life in DeKalb County, Tennessee. Adeline died on 4 October 1975. Cardene Johnson was born on 6 October 1911 in DeKalb County, Tennessee. 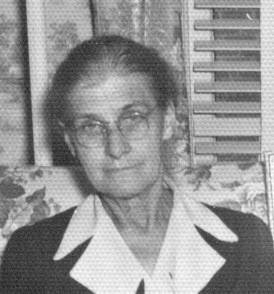 She married Alvin Emett Starnes (1909-1970) on 10 October 1931 in Putnam County, Tennessee. Cardene died on 18 May 1997 in Scottsboro, Alabama. Virginia Starnes was born in about 1937 in DeKalb County, Tennessee. Gertrude Irene Johnson (“Gertie”) was born on 13 April 1913 in DeKalb County, Tennessee. She married Alton Reeves Scott (1911-1967) on 17 May 1931 in DeKalb County. Gertie died on 10 December 1967 in Nashville, Tennessee, from an auto accident on the way to church Sunday morning. The wreck also claimed her husband’s life the next day. L. B. Scott (male) was born and died on 3 March 1934 in DeKalb County, Tennessee. Ella Jean Scott was born in about 1935 in DeKalb County, Tennessee. She married William Joseph Lee (1931-2000), who served as a technical sergeant in the U.S. Air Force in Korea and Vietnam. Ella died in about 1999 in Nashville, Tennessee. Joanne Scott was born on 12 May 1937 in DeKalb County, Tennessee. She married first to Mr. Blackman, who served in the military, and second to Billy Lewis Voyles (1932-1988), a master sergeant in the U.S. Air Force in Korea and Vietnam. Joanne died on 13 February 2014 in Alexandria, Rapides Parish, Louisiana. Polly Scott was born in Tennessee and married Mr. Manning. Janet Scott was born in Tennessee and married Mr. Edler. Eunice Elmer Johnson was born on 14 October 1914 in DeKalb County, Tennessee. 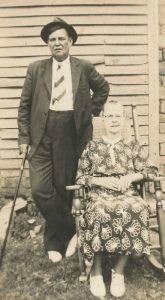 She married Delton Andrew Caplinger (1912-1981) on 3 June 1933 in DeKalb County. Eunice died on 15 November 2010 in Smithville, Tennessee. Frankie Caplinger was born in about 1934 in DeKalb County, Tennessee, and married Jack Watkins. Doyle Caplinger was born on 22 August 1937 in DeKalb County, Tennessee. He married Dorothy Carter on 21 July 1956 in DeKalb County, Tennessee. Doyle died on 26 January 2010 in Smithville, Tennessee. Charles Franklin Johnson (“Charlie”) was born on 22 January 1919 in DeKalb County, Tennessee. He married on 28 December 1937 to Nonnie Belle Mathis (born in about 1923). Charlie served in the U.S. Army during World War II from January 1944 to December 1945. Later he worked for the sheriff’s department and retired in April 1983. He joined the Masonic lodge in 1952 and he and his wife were longtime members of the Eastern Star. They had a son in 1939 and likely at least one other child. Charlie died on 25 March 1998 in Liberty, DeKalb County, Tennessee. Billy Johnson was born on 31 March 1939. He married first to Peggy Parsley. Before they divorced they had two children: Tony and Teresa (who married Larry Caldwell). Billy married a second time and had two more children: Gail Johnson and Travis Johnson. Billy died on 5 December 2004 in Liberty, Tennessee. Leon Johnson was born on 14 October 1921 in DeKalb County, Tennessee. Leon served in the U.S. Navy during World War II as an aviation machinest’s mate first class. He died on 21 August 1944 in the South Pacific from burn injuries received in a plane crash. Clifford Albert Gunnard Johnson was born on 24 May 1899 in DeKalb County, Tennessee. 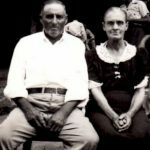 He married Maude Hindsley (born in about 1902) on 8 January 1918 in DeKalb County, Tennessee. Virgie Mae Johnson was born in 1920 in DeKalb County, Tennessee. 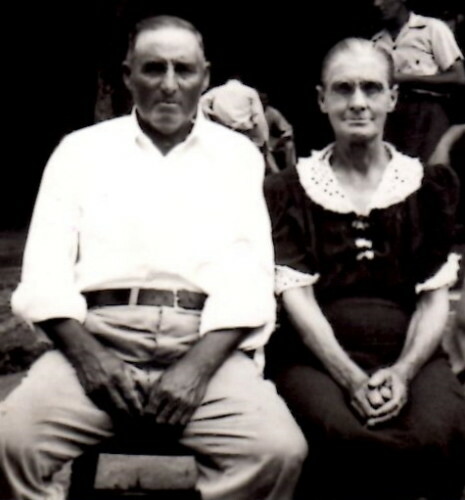 She married Jesse Lee Spence (1915-1963) on 12 December 1936 in DeKalb County. Together they had a child, Jerry L. Spence (born in 1938 in DeKalb County). 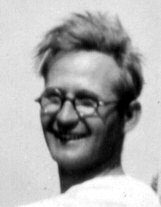 William Overton Johnson (“Bill”) was born on 13 April 1906 in DeKalb County, Tennessee. He married Mary Johnson on 3 July 1926 in DeKalb County. Bill died in May 1974 in Old Hickory, Davidson County, Tennessee. Fred Everett Johnson was born in about 1927 in DeKalb County, Tennessee. He lived in Ashland, Kentucky, for much of his life. He was a melter in open hearth at Armco Steel. Fred died at the age of ninety on 19 November 2007 and is buried at Rude Cemetery. Nealie Belle Johnson was born in 1909 in DeKalb County, Tennessee. She married Burley Driver (c. 1904 – after 1960) on 3 August 1924 in DeKalb County, Tennessee. They once resided at 804 Bryant St. in Old Hickory, Tennessee, and likely had no children.